Let us start by saying, we can’t wait until Etihad finally decide to launch a hotel concept, not that they have ever hinted at doing such a thing. The reason being, is that they have spent so many years looking at the hospitality area to develop their entire offering, they have become experts in their field in their own right. Looking at the new Arrivals lounge that the airline has opened in Abu Dhabi, you may as well be in a 5 star hotel. “Once again, we have benchmarked ourselves against some of the world’s leading hotels and restaurants, while placing the warmth of Arabian hospitality at the heart of the experience.” says Peter Baumgartner, Chief Commercial Officer of Etihad Airways on the launch of the new space. 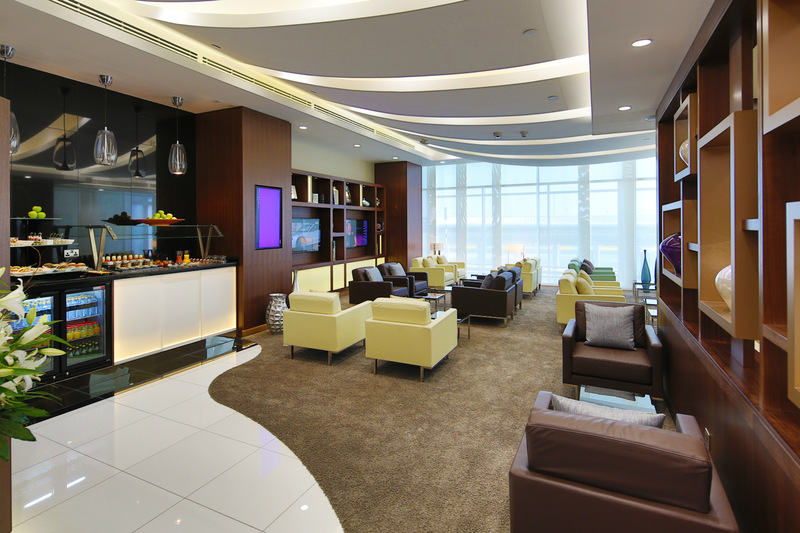 The spacious and well appointed facility is the first Arrivals Lounge to be operated by Etihad Airways, although not ground breaking as a concept, it helps lift the carrier further, prior to the arrival of their new fleet. 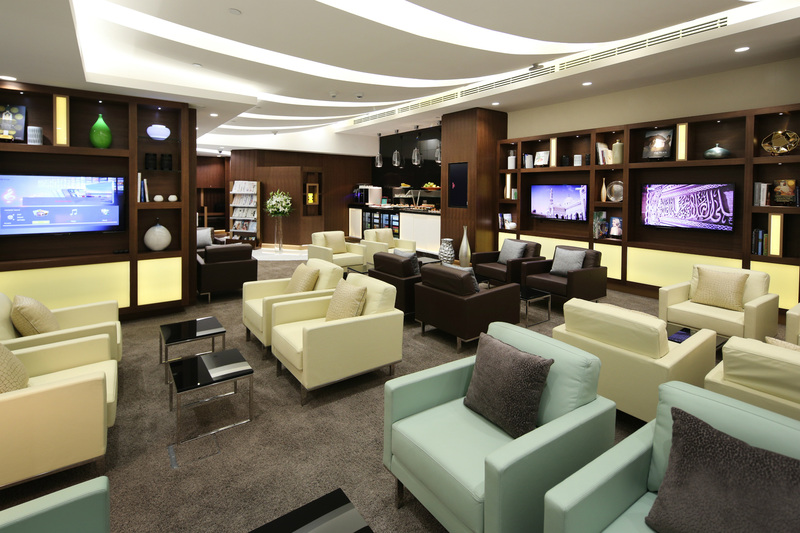 Conveniently located after customs, the stylish and modern lounge caters for both First and Business Class guests. Highlights include a dedicated area to freshen-up before leaving the airport, with 10 revitalising shower units, each equipped with luxurious amenities and linked to a complimentary service for clothes steaming. As part of the offering, garments such as suits and dresses can be steamed by housekeeping while guests shower, and will be returned within 10 minutes. 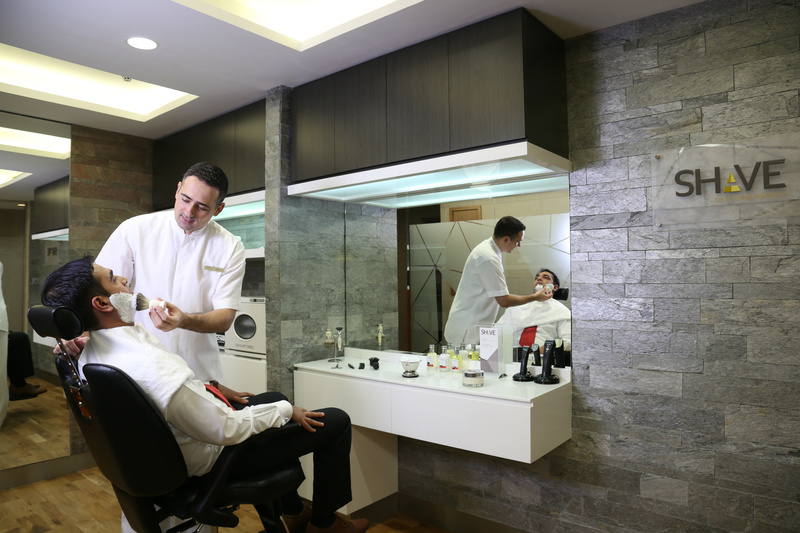 The innovative new ‘SHAVE by Etihad Airways’ concept has also been introduced inside the lounge, guests are offered a complimentary refreshing wet shave by fully-qualified barbers. For those keen observers, engraved in the glass reflected in the mirror, you also may see a hint to the new livery / brand image that has been seen on a variety of social media streams, although yet to be officially announced by the carrier. The space naturally also is home to a large relaxing lounge, featuring many comfortable seats, similar in design to those found in their departure lounges, as well as newspapers, magazines and books. For those arriving on early morning flights, you are able to delve into a welcoming breakfast, during the rest of the day an array of food, canapés, snacks and sweet treats are on offer, all cooked freshly by a team of chefs. There is also a business centre featuring a large apple iMac, printers, wifi and broadband connections. We always love a space to freshen up after a long flight, especially if running straight to a meeting, and Etihad have proved they understand what their ‘Guests’ demand, and have catered above and beyond for them.